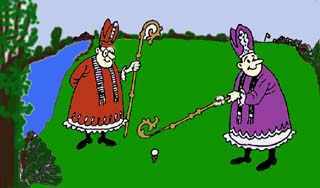 ROMWELL HUMOR - GOLFERS - Did you hear about the politically correct country golf club? "Did you hear about Tommy trying to drown himself in the water hazard on the sixth hole?" a weekend golfer asked his partner. "No kidding!" said the other. "What happened?" "Nothing really. He couldn't keep his head down either." The Englishman stormed over and angrily demanded a reason for her state of undress. "Well darling," she explained, "you give me so little allowance that I have to make the odd sacrifice. Usually no one notices." The Englishman thrusts his hand into his pocket and said, "Here's a ten spot. Go to Mark's and Spencer's and get some knickers." Two holes further along the Irish man's wife caught her foot on a molehill, tripped up and landed in a heap on the ground. Again her skirt was up over her head revealing that she wasn't wearing any knickers either! The Irish man was livid and he angrily demanded a reason for her lack of undergarments. With that the Irish man thrust his hand into his pocket and said, "Here's a five spot. Go to Woolworth's and get some knickers." Three holes further on, the Scottish man's wife caught her foot on an exposed root, tripped up and landed with her skirt over her head revealing that even she wore no knickers! Her explanation to her irate husband was the same as the others: Simply a lack of allowance. The Scottish man thrust his hand into his pocket and said, "Here's a comb. At least you can tidy yourself up a bit." Engineer: Why can't these guys play at night? An avid golfer playing with his best friend sliced his drive into an adjacent pasture. When he surveyed his lie, he noted a large barn between his ball and the green. "You know, if we open the front and back doors, I can hit the ball through the barn and onto the green," the golfer said. While his buddy ridiculed the attempt, the golfer struck the ball with all his might. It hit the barn and ricocheted, hitting his friend and killing him. Two weeks later the golfer, playing with another friend, found himself with the same lie on the same hole. His friend suggested they open the barn doors and that he attempt to hit the ball through the barn to the green. "No way," the golfer replied somberly. "I tried that two weeks ago and it resulted in a horrible tragedy." "I'm sorry," the friend said. "What happened?" "I got a double bogey." After hearing enough from his Senior buddies, the oldest, and the wisest of the four of them at 87 years old, piped up and said, "Just be thankful we're still on the right side of the grass!" Greg took up golf. One day when he was playing even worse than usual, he decided to explain his predicament to his teenage caddie: "I took up golf to practise self-control." The youngster rolled his eyes and replied, "If that's the case, you should have gone in for caddying." Did you hear about the politically correct country golf club? They no longer refer to their golfers as having handicaps. Instead, they're "stroke challenged." SHE: "How'd your doctor's appointment go?" HE: "Well, there's good news and bad news. My blood pressure's toohigh, and I'm overweight. But, at the doctor's suggestion, I'm going to take up golf!" SHE: "And the good news?" As two golfers approached the first hole, a pack of dogs began to run and play in the fairway. The first man teed up, yelled "28!" and hit his shot straight down the middle. The dogs scattered before the ball landed. "Why did you yell that?" "It's 'Fore!' in dog years," the first golfer replied. Let's set the record straight: this collection of newspaper humor strips has nothing--nothing--to do with golf, golf-playing cats, dancing bugs, or even nondancing bugs. What it does include are unbelievably funny satires on everything and anything. You'll find crazy send-ups featuring "Dennis the Menace II Society"; the O.J. Simpson story with Matt Groening's Simpsons characters; "Sam Roland: the Detective Who Dies,"; and "Harvey Richards, Lawyer for Children"
Hilarious new golfing phobias, pronunciations, definitions, and cartoons that any golfer, golf fan, or golf spouse will truly appreciate. From the bestselling coauthors of Leslie Nielsen's Stupid Little Golf Book comes another book of hilarious and worthless golf wisdom--a parody of the classic golf instruction book, Jack Nicklaus's Golf My Way--a book for the legion of hopless duffers and terminal hackers who know in their heart of hearts that no matter how much they practice, no matter what new tip they follow, no matter which foolproof method they embrace, they are never going to improve. 25 photos. This handy humor book offers fifty innovative tips to help you win at golf--there's just one hitch: they are all illegal! From placing itching powder in your opponent's golf glove, to hiding an extra ball in the cuff of your pants, Golf Dirty Tricks proves that victory comes easily to golfers with no scruples. As a bonus, Golf Dirty Tricks comes complete with seven flat-top tees. After all, if your partner can't tee up, he can't tee off! Three-time Pulitzer prize-winning cartoonist Jeff MacNelly--whose drawings complement the columns of Dave Barry--presents a new collection of cartoons, this time portraying the humorous struggles his characters encounter while they pursue the popular but often difficult game of golf. MacNelly's cartoons are syndicated in nearly 1,000 newspapers daily.